Well, the visit with DD1 is over and she is now in France visiting friends and enjoying the wine. While she was here, however, we had a great time exploring the city of York. If you ever get the chance it is definitely a place you should visit. The city is jammed with history. Archaeology is big here and new digs are always unearthing treasures from one era or another. You are literally walking on history wherever you go in the city. I knew the Romans spent time in England but I did not know that 3 emperors actually ruled the Roman Empire, at least part of the time, from York. Later, York was known as the capital city of the north. And, when William of Normandy invaded in 1066 he had such trouble with the "locals" he built to castles in York to intimidate and control them. He also burned houses and farms, killed livestock and destroyed the area north of York to such an extent that 100,000 people starved to death as a result. It is commonly acknowledged that Yorkshire has still not fully recovered from this assault on the area. For proof, check the population south of York and north of the city. Big difference. York, as was common in the middle ages, was a walled city. However, unlike most cities, large portions of the city walls still exist and walking along them is a popular tourist and non-tourist activity. 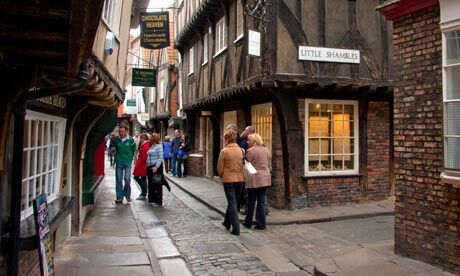 Many of the older streets remain in the city with probably the most famous being the Shambles. The windy street is narrow, the timbered buildings almost meeting in the middle, and the road surface still cobbled. I discovered that the timber framed houses we Americans call Tudor, a misnomer since they actually started earlier in history, were not designed to have the wooden framing timbers visible. They were to be plastered over to protect them from the elements. It was not until later, I believe the guide said the Victorian Era, were the timbers uncovered because exposing them was deemed more attractive. York was once home to one of the largest and wealthiest monasteries in Europe, until Henry VIII closed it and began to dismantle the buildings. What remains now are the beautifully evocative ruins of part of the outside walls of the monastery's church. York Minster, an awe inspiring Gothic cathedral that took 250 years to construct, and has a huge stained glass window: The Great East Window (the size of two tennis courts according to the guide), that is now undergoing cleaning and restoration. By law, no building in York is allowed to be higher than the Minster. The oak pews in the Minster are adorned with mice (the trademark of the carpenter who made them). It is fitting, then, that throughout the city you will find stone or metal cats perched on window sills, on the brackets for signs, climbing up the walls of buildings and sitting on roofs overlooking the city. Where there are mice there must be cats. During some previous restoration work to shore up the Minster's foundation it was discovered that the Minster had been constructed upon the ruins of a Roman barracks and basilica. These discoveries are now on display in the Minster's Undercroft. York is also said to be the most haunted city in Europe and evening ghost walking tours abound if you are not faint of heart. Who knows, you might experience and unexplainable icy wind or see a hooded figure of a long dead monk. York's location on the non-tidal portion of the River Ouse allows for wonderful walks along the river's shoreline. Part of this stretch is named in honor of Dame Judy Dench, think M in James Bond movies, who grew up and got her start here. Boat sightseeing tours are also available. Seeing the town from the water gives you a completely different perspective. For children of all ages and chocolate lovers especially, visiting the York Chocolate Museum and discovering the history of British chocolate would be a fun afternoon. You even get to make and then eat your own special chocolate lolly. York, among others, is home to the now world famous KitKat bar.